These Week 10 NFL Picks come from Hillary Clinton’s new condo in the battleground state of Ohio, where Cleveland versus Cincinnati shall define the future of the world for the next several years. Ohio, of course, is THE bellwether state – being a virtual little America with all of the elements of big America. And Cleveland versus Cincinnati encompasses all of that. If Ohio is like America, think of Cincinnati as Alabama and Cleveland as Massachusetts. One of these places is smarter than the other. And while both of these Ohio cities have professional football teams, neither one is the best professional football team in the state. That would be the team in the city of Columbus, the Ohio State Buckeyes, who don’t have to deal with the restrictions of the NFL salary cap. They can pay players whatever they want. But on Thursday, the Buckeyes don’t play. 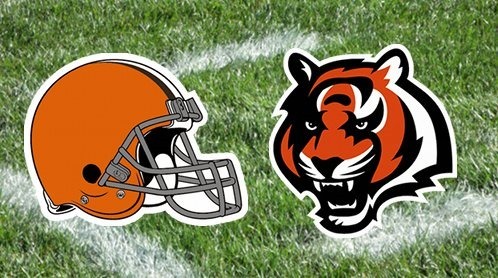 It’s the Browns versus the Bengals in a game that is, in the words of Lebron James, probably the most important football game ever. The winner of this game will determine the winner of the presidential election in 2016 when either the Republicans will carry the day with their slogan, “Four More Wars!” or the Democrats will win with their slogan, “We Can’t Agree On A Slogan.” And it should be obvious that that’s whatzgonnahappen. BYE AT COLTS – Andrew Luck tunes up his Amish buggy. BYE AT VIKINGS – Teddy Bridgewater joins Skinny Anonymous. BYE AT CHARGERS – Philip Rivers sells his Philip Rivers jersey and buys a Johnny Manziel jersey because he wants to be popular. BYE AT REDSKINS – Democrats in Congress send a lame duck good luck to Robert Griffin III . BYE AT TEXANS – Ryan Mallett prepares what he is going to say after his first three-interception game. This column is sponsored by fear of those I don’t understand.